Peekaboo trim and a sheer hem highlight the flirt factor of this BARDOT lace sheath dress. 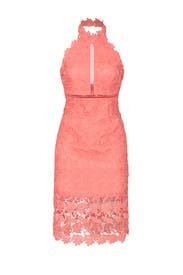 Coral lace (100% Polyester). Sheath. Sleeveless. Halter neckline. Hidden back zipper closure. Partially lined. 40" from shoulder to hemline, 8.5" Slit. Imported. A bit big for me - renting the medium now and hope it fits. Nice details - looks much more expensive than it is.